I don't know anything about fishing and angling, but I hear Islay (and Jura) are quite good places to go fishing. At least that's what a number of people are saying and there are certainly a number of lochs on Islay suitable for fishing. Finlay Wilson went fishing on Islay with his wife this summer and says it was a great experience. 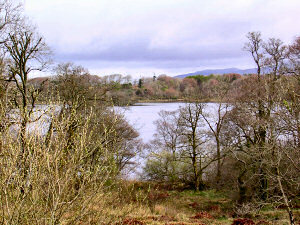 Among other places he went to Loch Ballygrant, shown in the picture on the left. This picture was taken during a walk in April 2004 and I remember Donald James (D.J.) MacPhee, gamekeeper at the Dunlossit Estate, telling us about fishing on the loch. The 2003 European Fly Fishing Championship was held on Islay and proved to be a huge success for all concerned, with quite a few of the participating anglers returning to fish again in more relaxing conditions. Terry Lawton went to Islay in April 2003 ahead of the championship and wrote this report about fishing on Islay, illustrated with a few nice pictures. Then there are the repeat visitors: The Fishing Trip - Isle of Islay 1995 to 2007, a lot of information and fishing diaries here.